Darren Wong and Khatu Ho’s gorgeous outdoor wedding almost didn’t happen. In the week leading up to the main event, all of the weather reports promised rain—and as the couple drove up to the Crane Estate, in Ipswich, the day before their nuptials, it was pouring so hard “you could barely even see through the windshield,” Darren remembers. Thankfully, the clouds parted in time for a stunning celebration that married their heritages (Khatu is Vietnamese; Darren is Chinese) with the bride’s flair for fashion. 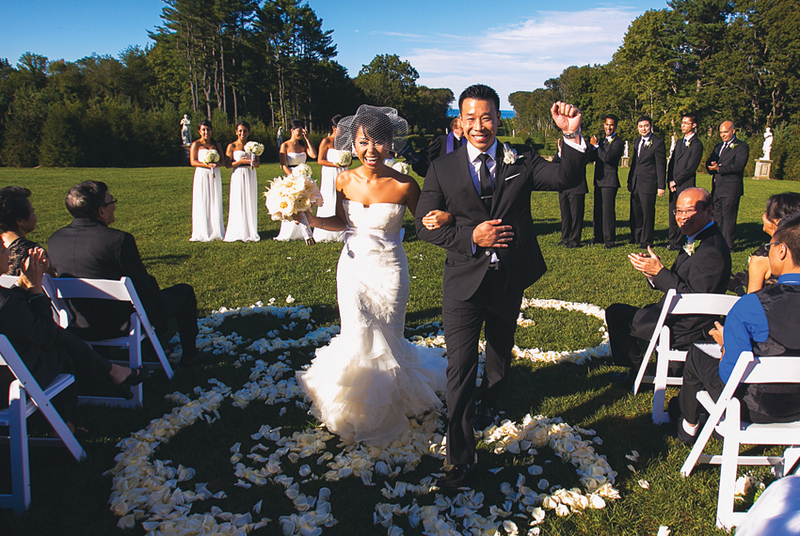 The picturesque Crane Estate was the perfect setting for an outdoor ceremony. “As soon as I got out of the car to visit it, I turned around and gasped and knew that was it,” Khatu says. 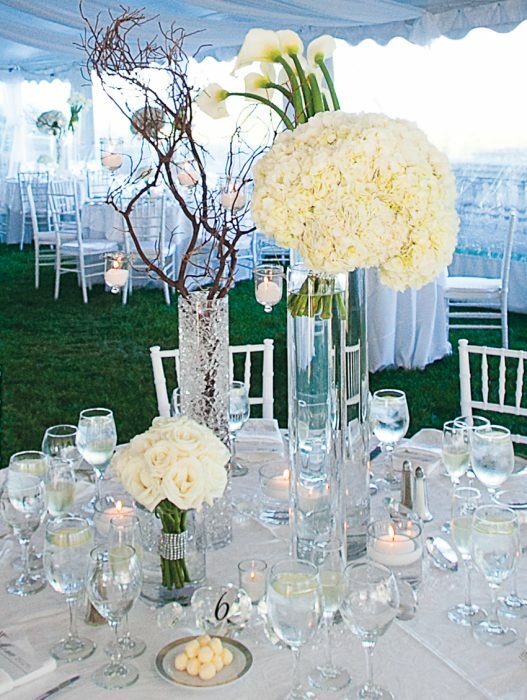 Centerpieces of varying heights decorated the tables. There’s an endless garden of centerpiece and bouquet options out there. 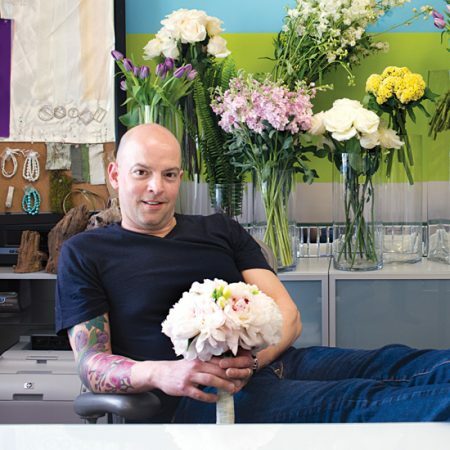 Self-taught floral designer Gregory Costa-Saint John can help you make sense of petal and stem. 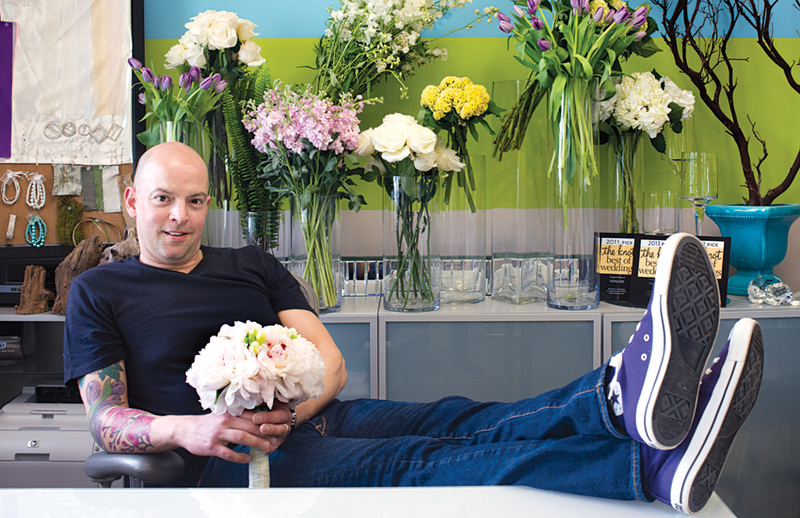 How far in advance should a couple start thinking about their floral arrangements? The sooner, the better. A year is ideal. Generally, we won’t meet with a bride until she has her venue booked. I can’t help with the vision if I don’t know the scale of the room that the ceremony and reception are being held in. If it’s a space with eight-foot ceilings, we’re not going to do high centerpieces because that will make the room look smaller. If it’s a huge space with really high ceilings, like the Boston Public Library, then you want higher pieces to make it more dramatic. What’s the best way to prepare for a floral consultation? Prior to our meeting, I send the bride and groom homework. We ask them for pictures of bridal bouquets, centerpieces, bridesmaid bouquets—pictures of things they like and don’t like. Seeing what they don’t like is just as important as seeing things they like. We also give them a document outlining the most commonly used flowers and make suggestions to help them think outside of the box. So when they come into the consultation, they’ve made some decisions, because they have a checklist. We also like to see pictures of the bride’s dress and her bridesmaid dresses, as they typically dictate the color palette. Has Pinterest made your job easier? It’s easier to understand a bride’s vision and what she wants, but it can limit our ability to be creative. We can’t always create that exact vision within the budget the couple has given us. How do you handle brides who want something that’s unavailable or out of season? I talk to them about look, vision, colors, and not getting set on a specific bloom. There are other options that can get you the same look without having to be exact. What are some of the floral trends you’ve been seeing lately? Rustic weddings are very big right now—lots of moss, birch logs, reclaimed wood. We’re doing a lot of work this season with mercury-glass vessels, too. We’re still using pastels and blushes, but we’re also working with a lot of deep, saturated pinks, blues, and purples, even in the spring. We’ve also seen terrariums and air plants as favors. Is it possible for a green-minded bride and groom to use only local blooms in their arrangements? The majority of our blooms come from overseas. If it’s not coming from Holland, it’s coming from South America. If I have a bride who’s having a green wedding, it really limits what we can and can’t do. With organic flowers, there is so much more TLC that is required from the growing stage to the design stage, because pesticides are limited or not used and therefore the blooms are not as sturdy and not as perfect—which drives up the cost. And if we use locally grown flowers, it reduces the carbon footprint, but the labor cost increases significantly. However, some of the blooms that we use are sourced locally, including dahlias, sunflowers, and zinnias. Are there flowers that cost significantly more than others? Orchids, gardenias, calla lilies, and flowering branches like cherry blossoms can get pricey. When flowers are just coming into season, there is a limited quantity, so they are very expensive. But once they’re fully in season, they’re a dime a dozen. I’m very big on repurposing. If your ceremony is in a church, why not use those two altarpieces at your reception? Or use your cocktail-reception pieces for your dessert bar? That way you can carry your vision all the way through from beginning to end. Are there any flowers you avoid using? I love lilies, but we try to stay away from them because their smell is so intense—and people associate them with funerals and death. English garden roses and gardenias also have a very strong smell. Have you worked on any outside-the-box projects recently? We did a South Asian wedding last year at the Hyatt downtown, and we designed all of the arrangements with dahlias, roses, and other flowers nested in green moss. We also used artichokes, green beans, and asparagus—the bride wanted her arrangements to be different from everyone else’s. The ceremony was outside, and the groom insisted that even though they were getting married in the city, he wanted it to feel like an enchanted garden. So we created a backdrop out of moss carpets that was 10 feet high and seven feet wide, and stapled it to a structure we built. And coming down from that were evergreens, orchids, and ivy. Where do you get the inspiration for your bridal bouquets? We like to start with the backdrop: the bride’s gown. We look at what’s going on between the chest and the knees—if there’s a lot of detail, types of fabrics, or intricate designs, then we don’t want to make a bouquet that’s too big, complicated, or textural. You don’t want it competing with the dress. From there, we’ll talk about colors. Has she envisioned her bridal bouquet to be in the white or cream family, or does she want to bring color into it? Then we start talking about specific flowers. Flou(-e)r, 175 New Boston St., Woburn, 617-514-3756, myflouer.com. Costa-Saint John’s favorite additions to fall and winter arrangements. These big, textural blossoms can be sourced locally in the autumn. When closed, the tight, compact blooms look like snowballs. When fully open, they are reminiscent of a fresh coating of snow—perfect for a winter celebration. Look for varieties with bright leaves or berries to complement your flowers. These flowers offer rich, saturated colors for colder months. The silvery hue and fluffy texture of this plant’s foliage make it another great choice for winter nupitals. Or try silver brunia balls to make your bouquet pop.